Live Door, one of the large Internet portal/verticals run by the now well-known maverick Horiemon, was raided last night the Tokyo District Public Prosecutor's office on suspicion of illegal securities trading. (Japan Times artice) Apparently they raided around 6PM last night and were there until this morning. One person who was visiting for a meeting reported that he was not allowed to leave for a long time and had to leave his papers there. Unlike the US, Japanese courts do not have a "discovery" process and often have to rely on these surprise raids to get necessary documents. It makes for good TV News. Horiemon has been rubbing old-school Japan the wrong way by challenging the establishment with clever financing and takeover attempts of the media etc. I can see how he would get targeted. On the other hand Japanese companies like his tend to be sloppy so I wouldn't be surprised if they find something. It would be unfortunate if they end up slapping Livedoor down since I think he was serving an important function in Japanese business and this looks like a typical set-up. Thanks to iMorpheus for reminding that I should probably blog this. UPDATE 2: Live Door is Skype's Japan partner. UPDATE 3: Apparently the first notice Live Door got of the raid was when Network TV called for an interview. TV knew before they did. "clever financing" is one way to put it. A lot of people are on Horimon's side because he is taking on the establishment and everyone knows they deserve to be challenged and beaten by young talent. At the same time, some of LiveDoor's business practices seem more old school than new school. If you set out to take on the old school boys who have been running this ship since before WW2 began, you better have a new bag of tricks. There is nothing new about faking financial transactions but if you want to play those games, you need lots of cover from politicians, media, business leaders and other power brokers. I agree with pepeluali that Livedoor looks old school sometimes. I don't use their websites, services nor softwares. I probably don't know much, but their stuff just don't look innovative to me like Technorati or those new school does. Certainly not looking good for LD: Livedoor Shares Halted on Falsified Earnings Report. And it seems that the Livedoor raid has caused quite some panic on the Tokyo stock exchange. Yes, I was just about to post a link to that myself, but Nils beat me to it. Quite exciting to wake up, switch on the TV and discover that something I read about on joi.ito.com yesterday is now front page headline news here in the UK this morning. Are you are claiming this was a "set-up", in that the Livedoor management did not engage in activities contrary to securities laws? I think we would all like to see you back up that claim. I would agree the company was targetted by prosecutors, but if you draw attention to yourself in the vulgar manner that he did, and pick fights with the establishment, you are inviting the establishment to attempt to teach you a lesson. The fact that Livedoor happened to position itself as a counterpoint to the establishment (more for financial, political and PR advantage than by the fact that it _really_ walked the walk of a better model of Japanese business - more like it aped the less appealing facets of US-style fundamentalist market capitalism as embodied by the dot.com fraudsters and others like Enron, Worldcom and a long list of other companies (thankfully considered passe by real progressive businesses) should not and cannot excuse breaking the law and attempting to manipulate the market. as it is about taking on parts of the establishment which require an overhaul and adopting more globally competitive practices. Fraud on the scale which is being suggested needs to be dealt with in the harshest terms, and we need prosecutors (and judges) taking a hardline stance against white collar crime of this sort. The maximum sentence for the breach of the securities code in question is a measly 5 years and the maximum fine an absolutely shocking \30M ($340k or thereabouts?). There are no doubt other companies who are engaged in similar activity, and ideally this case would be the tip of the iceberg, but somehow I suspect this will just be one (or a small number of) public execution(s) for show, and others will be allowed to go unpunished _as long as they don't get any ideas about challenging authority_. I fully agree that the establishment is well overdue for an overhaul, but g-d help us if Horiemon and his cohorts were our best bet. PS There were rumours in December that prosecutors were gearing up for a high profile hit. At the top of the list of prospects were apparently Livedoor and a high profile domestic PE fund who has been known to have dealings with Livedoor, both of whom have been bothering the establishment. Additionally, there are persistent rumours that the date of the raid was chosen to deflect attention from the Huser hearing in the Diet which the LDP probably suspected would lead to negative publicity for the ruling party and some prominent members (on the 16th there were reports that Shinzo Abe, the front runner for to replace Koizumi when he steps down in Sept, may be implicated in some way and Kosuke Ito who has prominently been linked to Huser is a faithful Koizumi soldier). One bit of good news coming from this ordeal which has hit the markets hard this last couple of days. We won't be seeing Horiemon anytime soon on TV outside the news, and his plans to release a CD of a band comprised of himself and some associates is likely to be shelved. The usual suspects are appearing here: an undoubtedly smart, but manipulative, entrepreneur in a hurry, gullible punters beginning to panic, and bungling bureaucrats at the TSE. Yeah, this raid also crashed the 2nd largest stock exchange too !! Nikeii correct ?? When I said "set up", I didn't mean that they were framed, but that they were targeted. Also, the fact that all the news knew about it before LD did clearly shows that this was a very well coordinated effort involving lets of different constitutents. I think it's a pity because most entrepreneurs aren't willing/able to stand up against the establishment and if they find Horie has indeed broken the law, it will be a pity as well. I'm not defending anything he has done, but just (if he is indeed guilty) wish he had been more careful and clean. Ahh well. fukumimi: you ever hear a phrase "innocent until proven guilty"? I'm pretty darn sure there is no equivalent in Japanese considering that the so called justice system here is still pretty much the same as it was in the Tokugawa era. Over the last few days we've seen that Livedoor and its executives may be accused of accounting irregularities as well as market manipulation/insider trading. The real question is were the activites illegal or not and the problem determining that is that the accounting laws and the securities laws are VERY unclear. The questions about Livedoor overshadow the real problems: Japan still is not a nation of law, the financial markets are almost completely lacking in transparency, the financial regulators hold no real power and the market (TSE) ended up severly impacted by what would be a relatively minor issue for the NYSE, LSE or Frankfurt Bourse. I agree that it would be a pity (as far as the big picture is concerned) if Livedoor is found to have engaged in criminal activity, because of Livedoor's perceived position on the Japanese business landscape. The implications may be far reaching, with even honest and productive companies (especially in IT, even though Livedoor is de facto not an IT company) being tarred with the same brush, and the public will be jaded and be more suspicious than necessary when a real revolutionary comes onto the scene. That would be a huge blow to the required overhaul of the Japanese business environment. I would suggest that many prosecutors everywhere are capable of (and are) being influenced into targetting their resources on specific targets by political pressures. Knowing this is the case (and perhaps to a larger degree than most in Japan), it is naive beyond my comprehension to engage in activities which are a very dark shade of grey (or pitch black, time will tell), if you are going to pick a fight with the establishment. It is my opinion that Horie cozied up with the LDP for last year's election because he thought he could get the LDP on his side (obviously the LDP had its own motives), to protect him from just this kind of politically motivated attack (and because he needed that political shield because of the skeletons in his closet). Unfortunately for Horie, it seems the LDP's priorities were now elsewhere. I fully agree that the legal principle of "innocent until proven guilty" is a foundation of a fair legal system and a free society. Perhaps I should have stated that my comments were personal opinion and commentary only, and that I was just exercising my right to free speech as an individual, another legal right which is the pillar of any free society. And this is not a court of law. The thrust of my comment is that if there was the sort of activity as has been suggested/reported (window dressing, false reporting, etc, etc), it is unethical, regardless of any inadequacy in the legislation which provides a legal loophole which allows weasels to get off the hook. Some people looked at Livedoor as some sort of model of "new Japanese business". Having observed Livedoor's growth and expansion, it was pretty clear from the outset that despite the media calling it an "IT company", it was basically a M&A vehicle, one which has not added tangible value to its acquisitions. It is basically without substance. As such, it is my personal opinion that this particular company and its management team are not suitable candidates for leadership of the next generation of Japanese business. An organization run by an ethically and socially responsible management need not fear getting targetted and suffering such severe consequences right at the top of the management chain. Such organizations do not do "clever" tricks which try to take advantage of perceived legal loopholes. These are the organizations which need to be given a fair and level playing field, to reap the rewards of their deserved success. That is the direction in which society and its structures need to evolve. I am in full agreement with you regarding the dire state of the Japanese legal system. It is in need of an overhaul. Vaguely drafted legislation, huge variance in interpretation by the courts, ambiguous handling of legal precedent, the list of problems goes on. Specifically regarding financial regulation and oversight is concerned, I also agree that the current Japanese system is totally inadequate, and more needs to be done to arm the authorities with tools and resources to monitor the activities of companies. Live Door was targeted because they are trying to get into the TV media market, thats all. 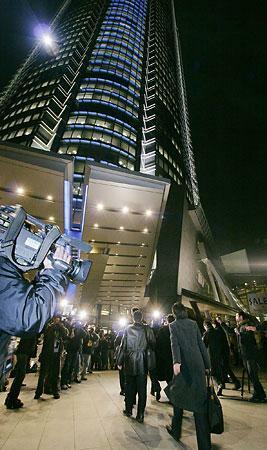 The old club of media doesn't like it and has been out for blood since live door tried to buy a controling share of Fuji TV. Number 2 to Livedoor found dead in okinawa hotel. Vice President of HS Securities and ex-employee of Livedoor, (used to head up their investment company, was one of the IPO team at "On the Edge" which became Livedoor, and involved with the investment fund which was at the center of the Money Life/Livedoor Marketing transaction, and also still had a bundle of Livedoor stock) found dead, "police suspect suicide". This development (I stumbled across it at Yahoo News just now) will be widely reported in the US because the Live Door raid and its affect on the markets was already pretty big news. It was odd hearing it having read it here first. It will be even odder now. 1. Many investors fear more raids. 2. Many more companies are fearing to get raided, too. 3. Many more raids are justified. Usually the professional investors are smart. As for Horiemon's role: Small dogs bark loud. If he was a super successful entrepreneur he would just sell more products and services, get rich first and then go into whatever is more fun for him. As he seems to do the contrary I am tempted to think that he is not as hopeful as many have thought him to be. I do agree that Japan needs to change and modernise and that fresh blood is needed for this process. But it is the same here in Germany and many other countries, too. So I hope that Horiemon's case will teach a good lesson to all of those who want to improve the country: Be smart, don't bark! "Apparently the first notice Live Door got of the raid was when Network TV called for an interview. TV knew before they did." Sure about that? Gossip travels fast in Tokyo. Joi, I think you the following few facts about Japanese business and Japanese law. #1 The conviction rate if charges are formally filed is around 99%, so even if he is innocent he is still guilty. #2 He shock alot of trees that were comfortibly rooted. Old Japanese businesses don’t like to be publicly embarrassed, I think part of the reason the media knew before had about he raid is some people wanted to embarrass Horie and Livedoor. #3 The banker that killed himself makes them look guilty even if they aren’t. #4 Pride comes before logic, old Japanese businesses seem to behave like jealous women. They don’t like someone hogging the spotlight, they tend to react before thinking what damages their reactions may inflict on the Country as a whole (as evident by the stock market crash that occurred just after the raid). #5 Even if no charges are ever filed investors trust in modern businesses in Japan will be damaged again for a long time. Here is what happened on 16th Jan 2006 at Livedoor. is searching the office of Livedoor and Mr. Horie's home. 16:18 Nikkei reports in NikkeiNet that Livedoor is being investigated. 16:30 Nippon TV news desk NNN phones up Mr. Horie for comment. "No police here"
MoneyLife KK in Oct 2004. 19:00 NHK reports live on TV the Livedoor search. Here is my 2 cents worth. 2. TV Media are idiots. 3. Japanese SEC has no regulatory power at all. Only stupid people invests in Japanese stock!!! Do you have some sort of subscription or arrangement with Jiji, or is your use of the photo "fair use"? Yes! Live Door was targeted because they are trying to get into the TV media market, thats all. The old club of media doesn't like it and has been out for blood since live door tried to buy a controling share of Fuji TV. Listed below are links to blogs that reference this entry: Live Door raided last night. Joi Ito - "Live Door raided last night" by Joi Ito is licensed under a Creative Commons Attribution 4.0 International License.